Even at the freezing temperatures of space hydrocarbons + ultraviolet light = interesting chemical reactions. Another sign that life could have originated in space? George Dvorsky reports new cosmological calculations that suggest there is a tiny chance that life could have spread from Earth and spread to our solar system and beyond. Award winning author Seanan McGuire (who also writes as Mira Grant) talks about the research she did to create a plausible zombie virus - a sort of hybrid between a Marburg/Ebola-like virus and a coronavirus. It apparently helped that the CDC has filk fans on their staff. Why did "The Jetsons" have such an impact on the public imagination, despite only airing a single season's worth of episodes? The article goes into some of the possibilities, including its depiction of a happy middle class future. I also think the series - which aired in re-runs for decades - exposed a huge number of young impressionable viewers to the tropes popular in science fiction stories of the Golden Age of SF, who would never otherwise pick up a pulp magazine or read a science fiction novel. It is thought that the mitochondria of animal cells and the chloroplasts in plant cells originally started out as independent microbes. At some point in our distant evolutionary past, the small microbes were engulfed by larger cells and became one with them, in a process called endosymbiosis. Now scientists think they may be seeing the process in action: an ocean bacterium seems to be forming an endosymbiotic relationship with an alga. Will they become inseparable? An internal water-conservation design for desert-living humans - perhaps Earth in 100 years's time. Better than a stillsuit? Check out this video about how the proposed system works. I've been reading up a bit on the ENCODE (Encyclopedia of DNA Elements) project, a massive collaborative project analyzing the "functional elements" in the human genome. It seems like an interesting and worthwhile project, but I think it's unfortunate that their recently announced publication of a bunch of their results has been hyped and misrepresented in the mainstream media touting the "new" discovery of fantastic functions for "junk" DNA (all scare quotes intentional on my part). And that was due at least in part to the way the results were presented to the public by the ENCODE Project itself. We didn't really "lose our chance", instead evolution simply resulted in a different arrangement in humans. We may be happier because our pineal gland is no longer in our forehead. Was the first sapient self-aware human a psychopath? Perhaps all those SF stories where mutant humans with superpowers who despise their weaker forbears aren't far off the mark. The IgNoble awards do a good job of highlighting scientific research that at least at first glance seems wild and wacky. But often there are important implications of the offbeat results. See, for example, the study that showed that a dead salmon could produce what appears to be a signal showing neural activity on an MRI - the lesson is not that MRI is bogus, but that careful calibration is required before you can draw conclusions from a study based on MRI results. See also how EEGs can record "brain" alpha waves from jello. "Drosera glanduligera, a small carnivorous plant from southern Australia, snaps into action, flinging its prey into its leaf trap." Monstrous plant - imagine if it were people-sized! 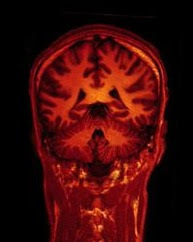 Image: MRI Brain Scan by Jon Olav on Flickr, shared under a Creative Commons Attribution 2.0 Generic license. It is neither a salmon, nor a bowl of jello.